Tattu was one of those places I’ve pondered visiting for a while. 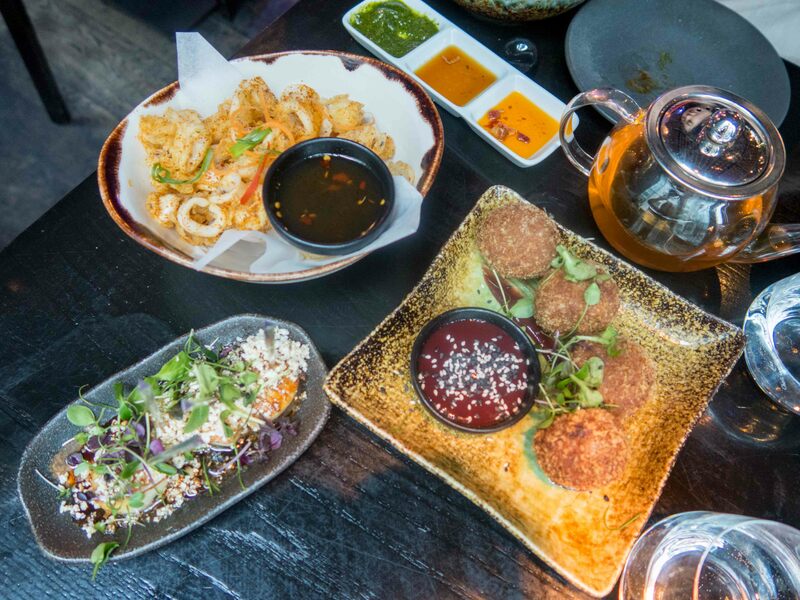 With an Asian fusion vibe, the food was either going to be hit or miss. 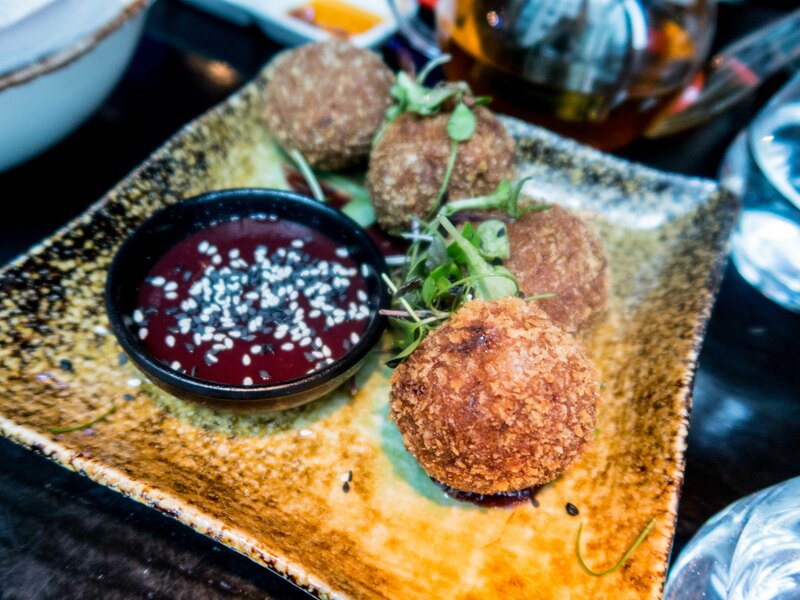 I’m not against the idea of Asian fusion food, but as I grew up with Asian food, I know what is considered good by those standards and will therefore draw comparisons. Of course, I also grew up eating Western cuisine from my home country of Northern Ireland so I’ve had a varied upbringing in terms of food. 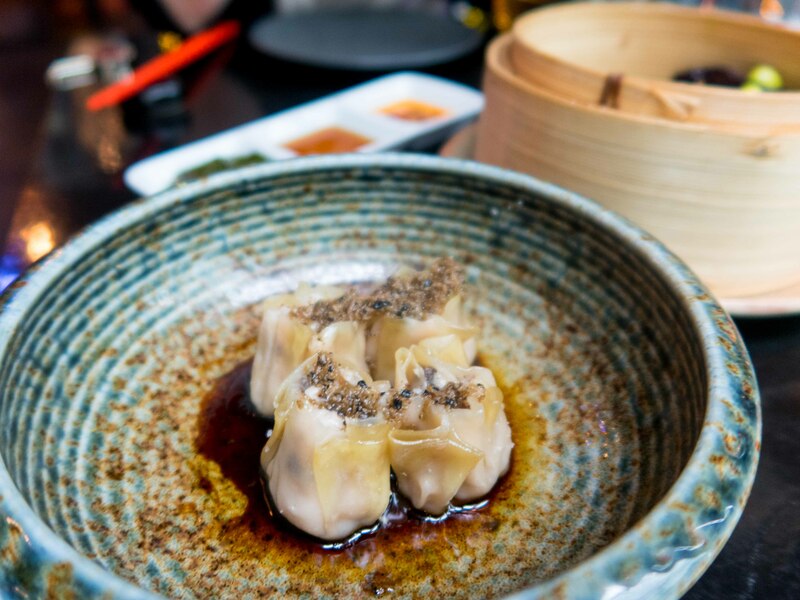 When done right, fusion food can work, Hong Kong cuisine is proof of this blending of Chinese and English flavours. 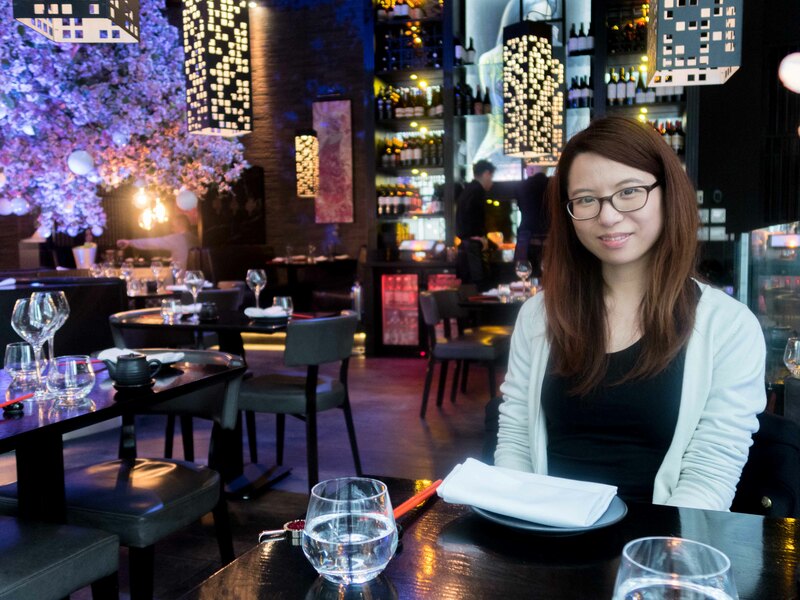 Tattu is located in Spinningfields, so I had high expectations for its interiors. 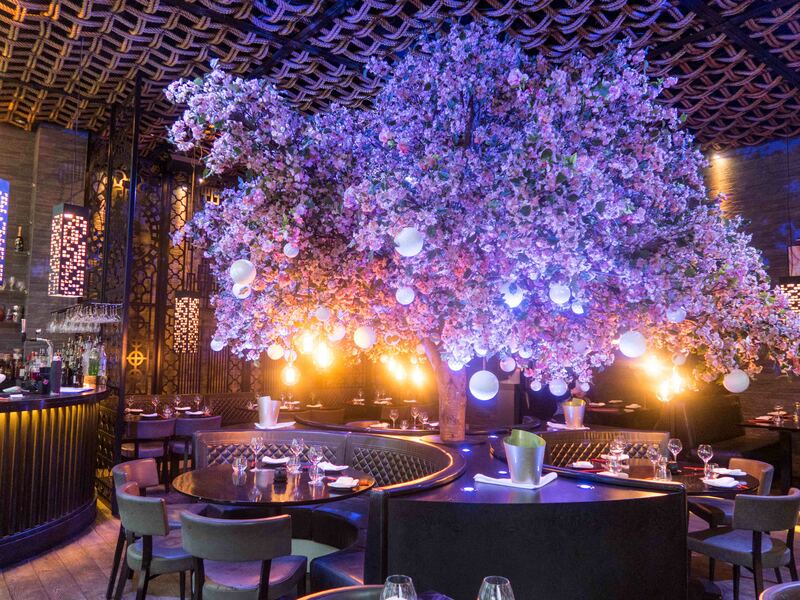 I’ve seen several photos of its famous cherry blossom tree in the middle of the restaurant, so was really excited to see this in real life. I almost wanted to sit under it, but as it was just my sister and I, it would have been inconsiderate to take the larger tables under it. I was sat facing it for the meal, so there was that. 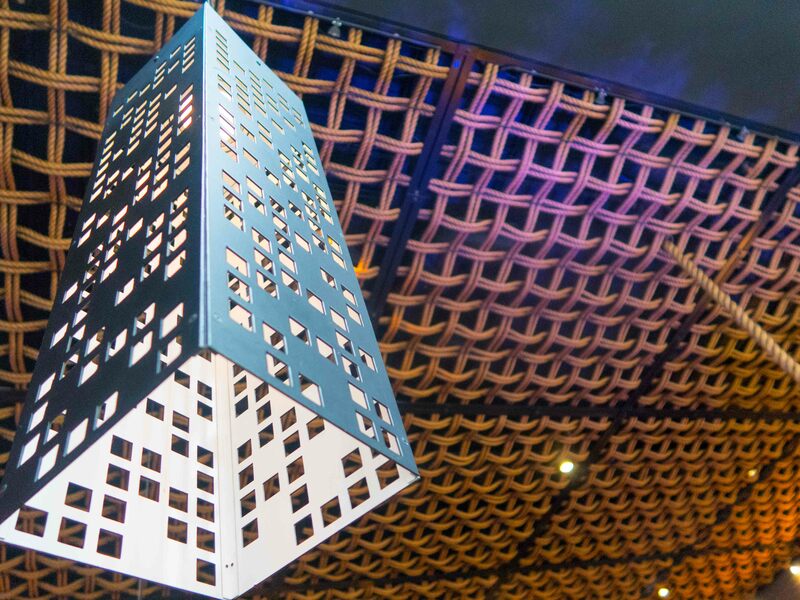 Aside from the famous tree, the rest of the decor had Asian influences with a modern twist. 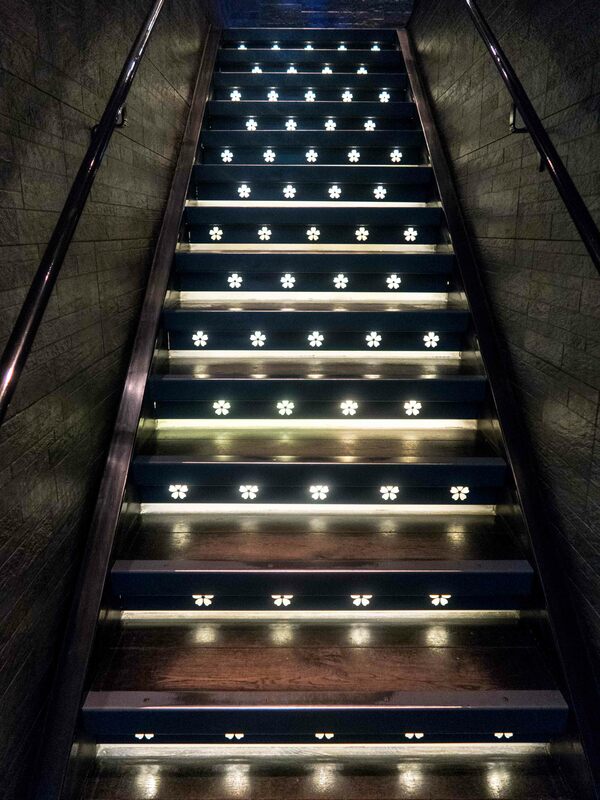 I really like the lotus flowers on the stairs leading up to the restaurant. 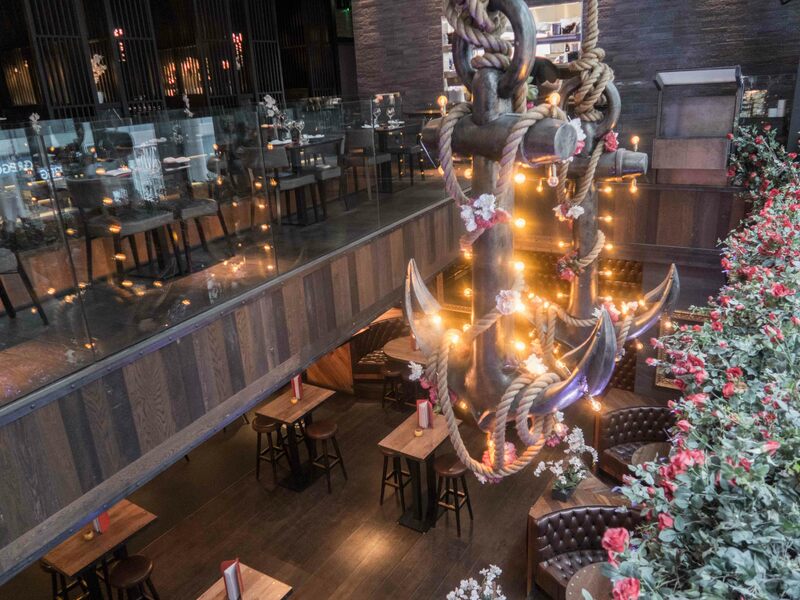 There are some nautical influences with the anchors used as lighting on the area overhanging the bar area. This part I’m always unsure about as it has a colonial vibe to it, I’ve felt similar with Grand Pacific’s interior. I ordered the rose and lychee tea, which smelled amazing and had a nice subtle sweetness. My sister ordered the jasmine tea, which was fragrant. 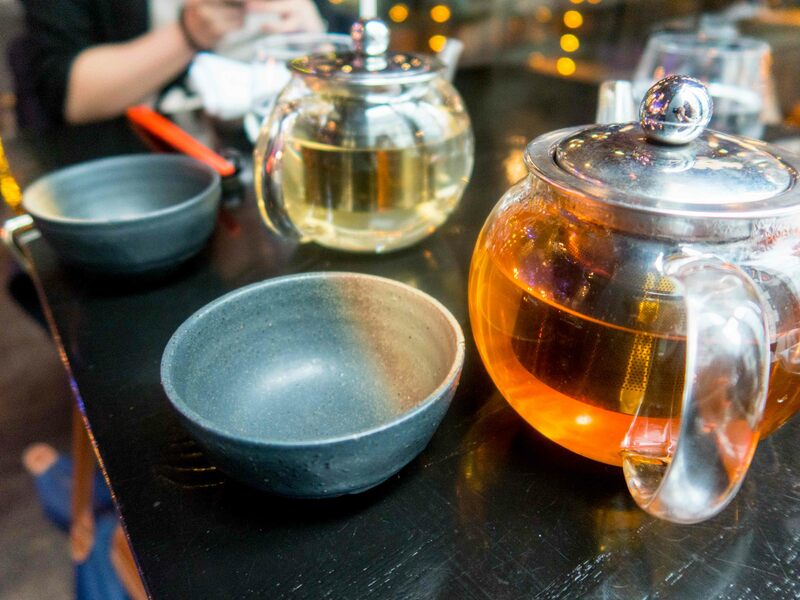 We both enjoy our teas, having consumed much of it at many Chinese meals.Each pot of tea was £3 with unlimited water refills. I realise that these teas may not be to everyone’s taste, especially if you are used to more full bodied teas like tradition English Breakfast (they also serve this!). 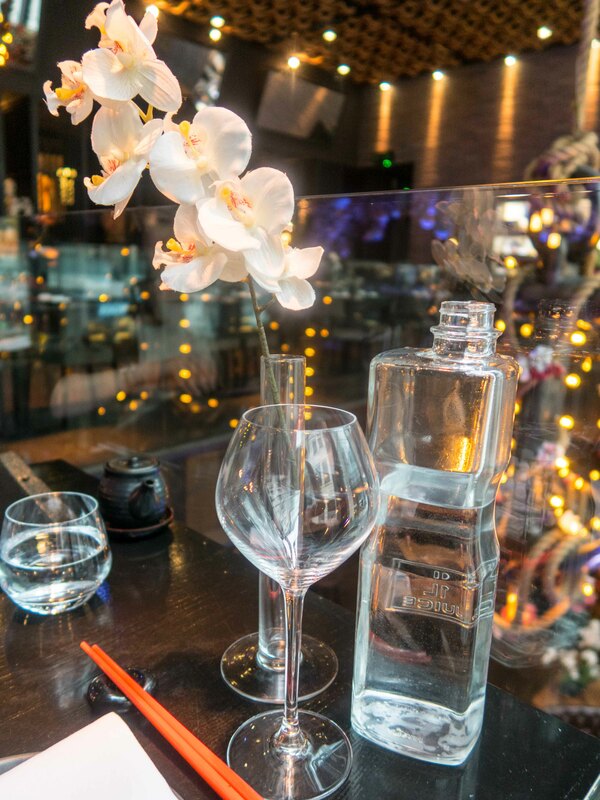 Tattu do also serve a range of other drinks from cocktails, to wine, sake, fruit juice and coffee. My sister and I are of course, dim sum experts. 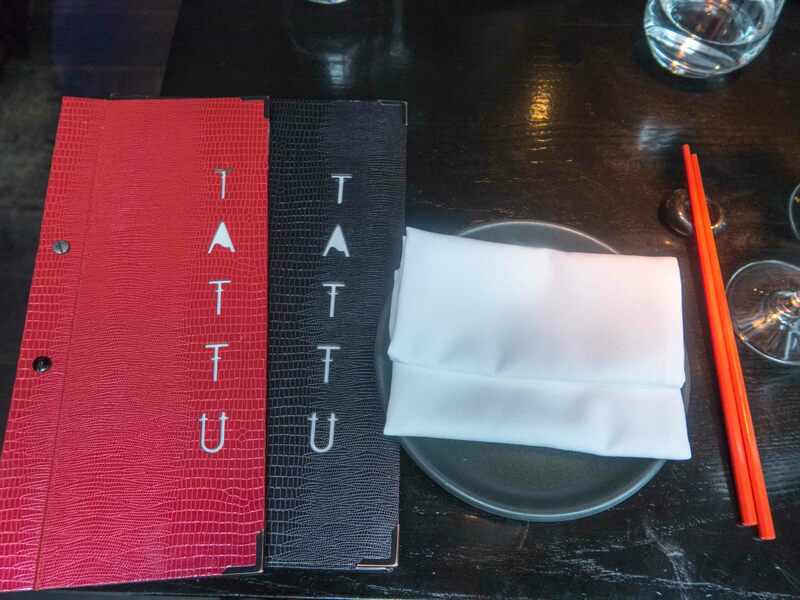 Tattu have reinvented classics like the har gau (chinese dumplings with prawn), shumai (chinese prawn and pork dumplings) and xiao long bao (chinese pork dumplings with soup inside). We ordered the Chicken Truffle Shumai (£7) and following the advice from our waiter, the Mixed Dim Sum Basket (£12.50). There is also a vegetarian version of this basket for £9. 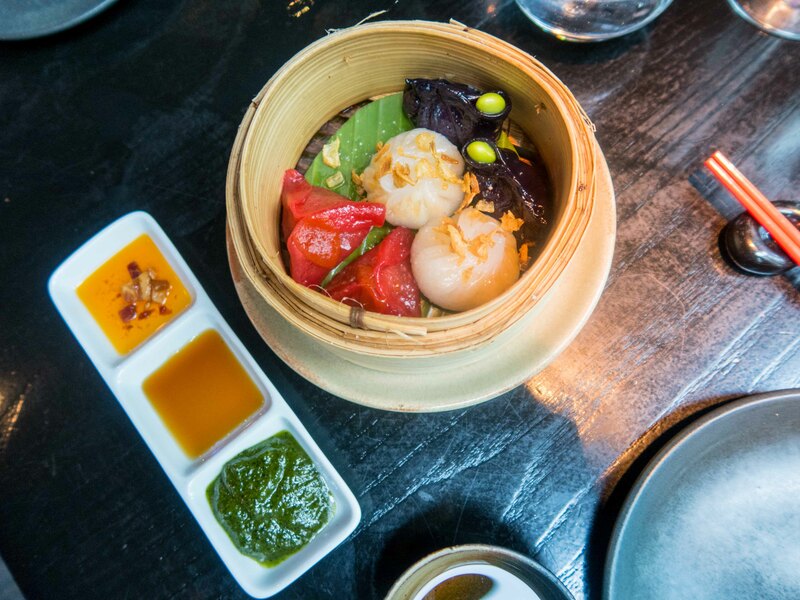 The Mixed Dim Sum Basket comprises three items you can order separately from the menu. The basket contains two of each item, whereas I assume ordering separately you would get four. 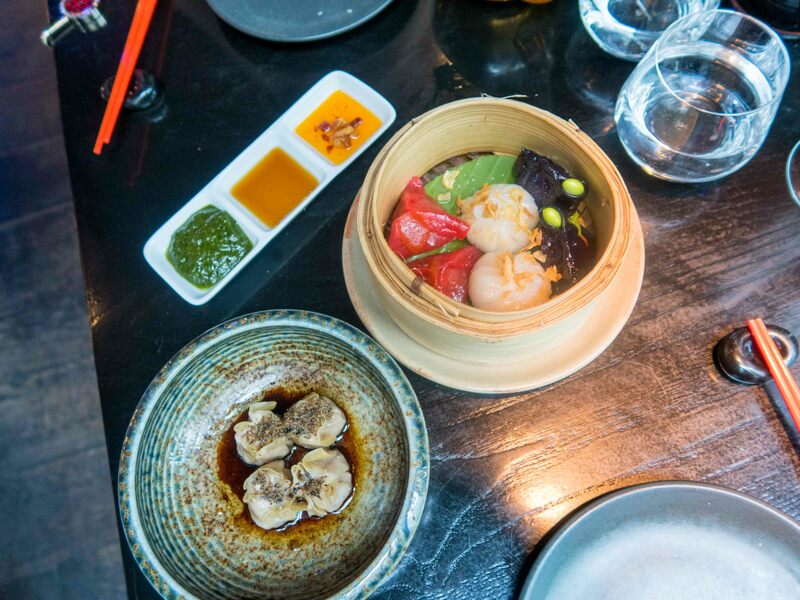 The three items are the spicy Wagyu Dumpling with kimchi and spring onion (in red), the Chicken Xiao Long Baos with red Thai curry, shallots and coconut (beige dumpling) and the Black Cod and Asparagus dumplings with prawn, edamame and squid ink (in black). Each dim sum came with a dip. Overall, I wasn’t really sold on these. Both of us found the dumpling skin too thick for each one, something that is definitely a no-no for traditional dim sum. The wagyu beef was indiscernible from regular beef due to the size of the dumpling and the kimchi was so-so. I feel like just having normal beef would have been fine for this dumpling. The Chicken Xiao Long Baos were the most disappointing as the curry was so thick, it was so far removed from the soup in a traditional Xiao Long Bao. The Black Cod and Asparagus dumplings were ok, but again marred by the thickness of the skin. Very disappointing. Following on from the Mixed Dim Sum Basket, I expected similar with the Shumai. I was pleasantly surprised to find these absolutely divine! The truffle was a beautiful addition to the chicken, giving depth to an otherwise plain dumpling. The size of each one was also perfect. Absolutely delicious and probably my favourite savoury dish. Not wanting to just get dim sum, my sister and I tried out some of their small plates too! 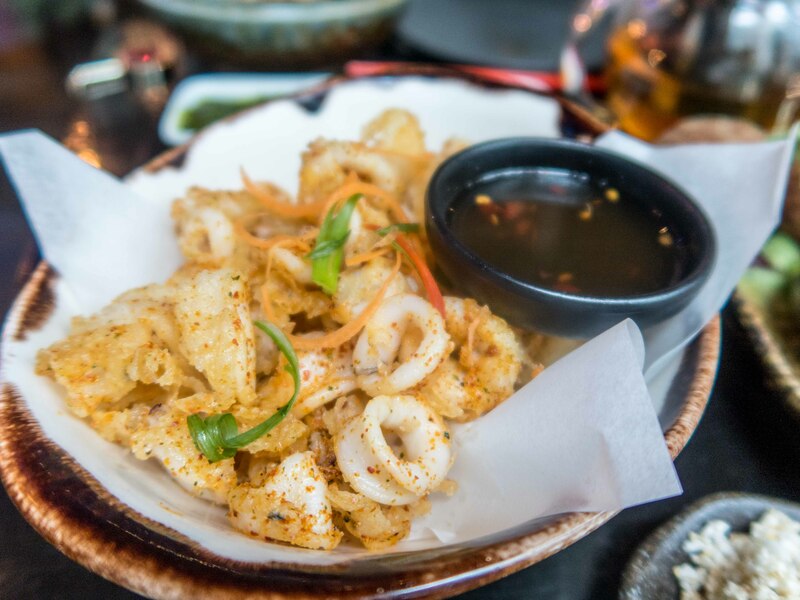 A more refined version of the traditional salt and pepper squid you see on many Chinese take away menus. When I saw this, I knew I had to order it as it is one of my favourite dishes. The batter on this was so light and not oily, which was delightful. The was a good plate and if anything, the fact it was baby squid marred the experience as we were just chomping away at small bits of squids; I knew in my heart I craved the bigger pieces offered by chopping at normal sized squid. The sweet chilli dip was ok, but I enjoyed eating these on their own. Scallops are one of my favourite seafood, but I don’t trust myself to really cook them well at home. 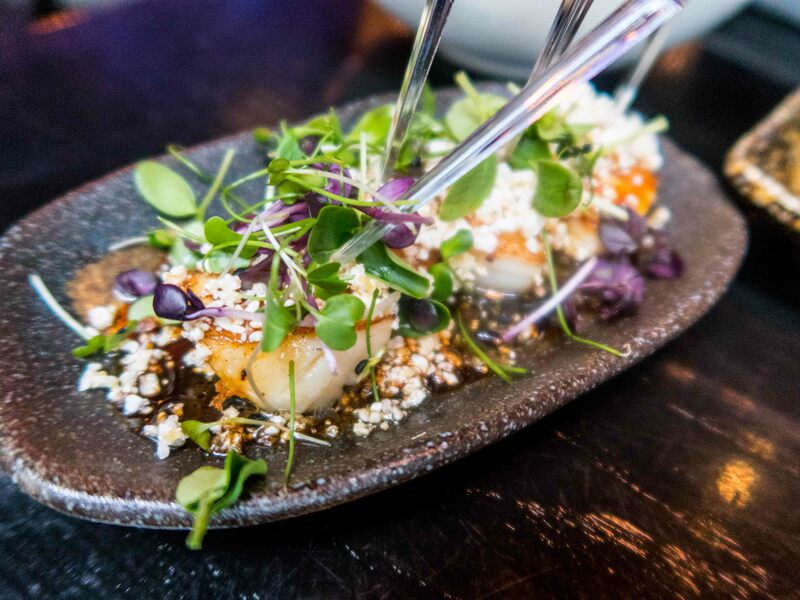 This offering by Tattu was delicious; the scallops were seared perfectly and not rubbery and the teriyaki sauce wasn’t heavy or sickly sweet. The crackling added an interesting texture and crunch to the dish, although I think it could have done without this. The duck bon bons were huge. As with the squid, the batter covering these weren’t oily at all and had a good amount of crunch to it. The duck inside was succulent, despite the size of the bon bons. The hoisin and cherry combination worked very well and complemented the duck, but can be overly sweet if you take too much sauce. Overall, it’s an interesting idea. 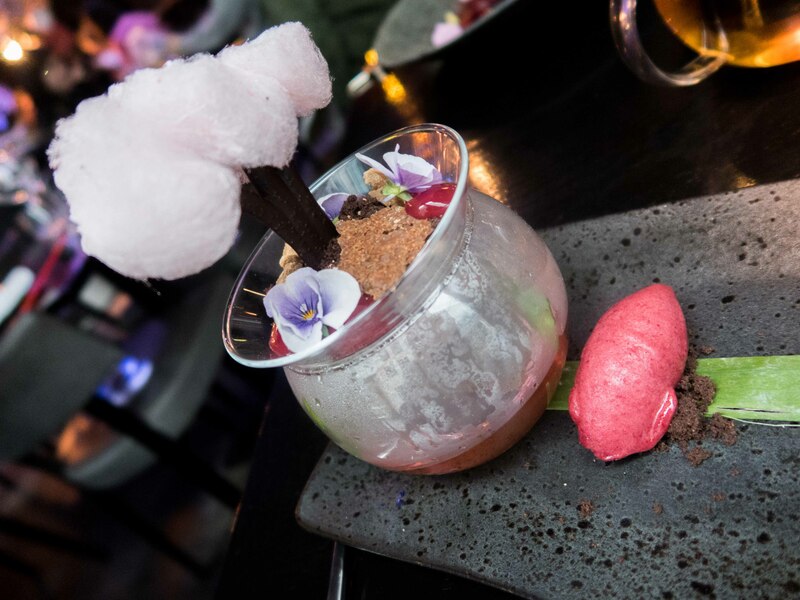 We couldn’t leave without trying the desserts too! I had to order the Cherry Blossom dessert after seeing so many pictures of it, it is also one of Tattu’s classics. Cherry is also a fruit flavour I really love in desserts, next to pear. 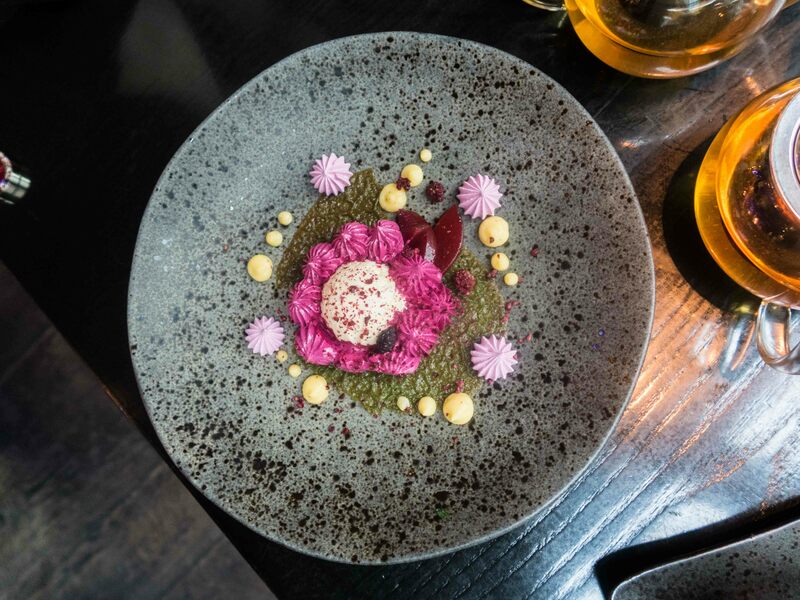 The dish is absolutely stunning in it’s presentation, with a dark chocolate tree, candy floss representing cherry blossoms, and a soil made from cherry, chocolate and edible flowers. All of this was served over liquid nitrogen and a small cherry sorbet to the side. I highly recommend this dish; it not only looks nice but tastes good too! My sister order the Baked Lotus Flower, as she was after a lighter dessert. Unfortunately, despite the presentation of the plating the meringue wasn’t really made well. The texture was soft, lacking the bite required in a decent meringue’s outer shell. This lack of texture made the dessert overly homogenous and a bore to eat, which is a shame. 6/10, -3 for the dim sum basket, -1 for the baked lotus flower dessert. Tattu definitely has plating done well, but I feel like the flavours and textures can be hit and miss depending on what you order. What I enjoy you may not necessarily also enjoy; it is experimental cooking. Maybe. I’d like to try out more of the small plates, but may give the dim sum a complete miss (apart from the shu mai)! It is fairly upmarket, so only for special occasions or guests. Have you heard of Tattu before? What’s your favourite Chinese food?